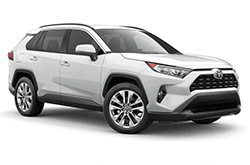 The Toyota RAV4 Auto is a no-nonsense crossover that promises power and dependability and it delivers that and so much more. It's tough and strong, and a capable towing vehicle that is popular for car rentals in the area and is always high on the request list. It’s a great vehicle for sightseeing, shopping, business travel family vacations, or any other travel needs that you may have. It has plenty of seating and cargo space and is also ready for whatever road you want to ride. Make your reservation today and enjoy great mileage, advanced safety features, and comfort that makes any drive a pleasant one. Don’t miss out on this opportunity to experience the Toyota Rav4 Auto for yourself!